4-Word Review: Life crisis at 30. 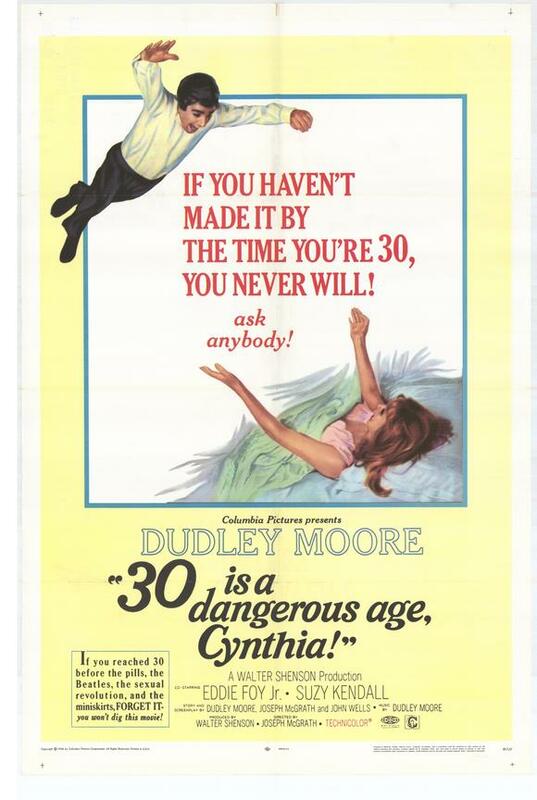 Rupert Street (Dudley Moore) is a struggling pianist and composer who with only six weeks until his thirtieth birthday feels that his life has been a failure. He sets out to change that by setting some very lofty goals, which is to write a musical and have it produced as well as getting married even though he has yet to find a girlfriend. The film, which was directed by Joseph McGrath is filled with the wonderfully drool British humor that manages to be both lightly satirical and imaginative all at the same time. The rampant cutaways in which a character will be talking about something and then it cuts to show them doing what they are imagining or discussing lends a nice surreal quality. The banter that Moore has with a Registrar (Frank Thornton) where he tries to get a marriage license before even having picked out a woman is the high point of the film and a perfect example of the wacky humor of that era from that region of the world that balances being both subtle and over-the-top that I wish more American movies would be better able to replicate. The supporting cast helps a lot and is full of comic pros. The elderly Eddie Foy Jr. is a scene stealer as Rupert’s best friend and so is Duncan Macrae, whose last film this was, as Rupert’s boss. Patricia Routledge is great as his kooky landlady and Suzy Kendall is highly attractive as his fiancée. There is also an amusing parody of 1940’s detective movies featuring John Bird as a self-styled film noir-like private eye. Unfortunately the script, which was co-written by Moore, suffers from too much of loose structure. The jokes are poorly paced and many times the comic bits go on longer than they should. There is also an intermixing of musical numbers that features Moore at the piano, which does not work well with the rest of the film. Yes, Moore was also an excellent pianist, but this was no place to be showing it off and these segments only help to bog the film down as a whole. The ending, which features Moore having to witness the desecration of his musical by an overzealous director who has a different ‘vision’ for it is priceless, but in-between there are a lot of lulls and the film would’ve been helped immensely by having a tighter script and a more structured, plot driven story.